Comfortable apartment set few minutes walk from major city sites such as Castel San Angelo, and the Vatican, on the other side of the Tibre there are the Spanish steps and Via del Corso, near transports that will allow you to reach the other parts of the city, near shops and restaurants. Independent heating, cable TV, cd & dvd player, piano forte, fans, hair dryer, washing machine, dishwasher, cot, internet WiFi, doorman, elevator, balconies. Beyond Piazza Cavour in a prestigious building from the 1800th, this grand apartment with three spacious bedrooms and one smaller bedroom, two bathrooms, two big living rooms with a fabulous grand piano and a living kitchen, is perfectly located to walk to all the main touristic location in the hearth of Rome. This apartment has a great history of hospitality and it can accommodate from 2 to 6/8 people traveling together. 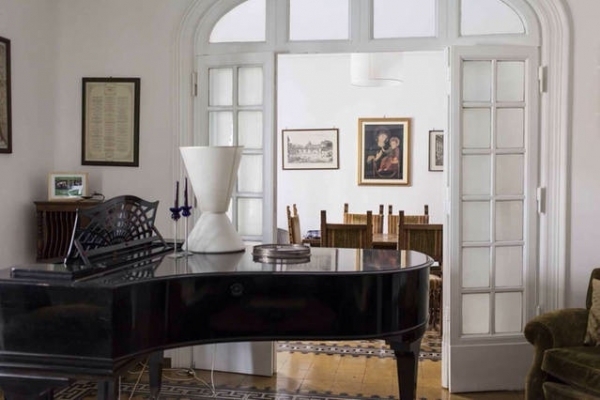 The presence of a grand piano makes it special and the two balconies in the 2 living rooms give the possibility of observing the life of a special roman corner. The 4 bedrooms (3 very spacious one and a single smaller one which is more a studio space) are all facing an internal courtyard so they are very quite, you would sleep really well because of that. The kitchen is fully furnished with all kind of things you may need if you want to eat at home. This apartment was wonderful.... a very good location, well maintained, quiet and attractive. Walking distance to major sites and streets, and very close to a bus stop. The piano was an added delight. The owner was most helpful in arranging transportation. The only reason I did not give it a 5 star was the smaller bathroom had a sewer odor that did not dissipate; however, the larger bathroom was fine. Rented the gran piano apartment in in Rome in 1998 for the first time through Roman Reference and then again lately. I give it a top rate because of its location and comforts.